Why does the US flag wave? A return to a tried-and-true subject of skepticism: the Apollo Moon Hoax. In this shorter episode, I discuss two of the most common claims that you may hear: Why does the US flag appear to be waving in photographs, and if we went to the moon, why haven’t we been back? There are no additional segments in this episode, and it is significantly shorter than my recent standard. This is also the episode for the second half of March. The long-awaited sequel to the critically-acclaimed (ha!) first part on James McCanney’s ideas about stuff. As I said last time, I’ve wanted to talk about James McCanney’s ideas ever since I heard him on Coast to Coast AM, and doing so isn’t hard — he’s been on the show dozens of times over the last two decades. I’ve heard him talk about a lot of things, but I mostly remembered him sounding like a broken record talking about how comets “discharge the solar capacitor.” This episode gets at many of his other ideas, though there are still many others and I reserve the right to do a Part 3 in the future. Because this episode runs nearly 55 minutes, the only additional segment is two New News items (one sent in by Graham and the other by Callum (@ApproxPurified). Also, I plan on the next episode to be about conspiracies surrounding the Rosetta mission and its now host comet, so if you happen to see something relevant, please let me know before December 12, 2014. P.S. My internet connection is being flaky — please let me know if you have issues downloading this episode or getting it to show up in iTunes or another RSS reader. (And for some reason, my audio seems a bit quiet relative to the host’s (Jimmy Church) … sorry ’bout that). My goal during the interview was to provide plausible, science-based explanations for, well, whatever we talked about, to show that the scientific explanation is at least as plausible as the conspiracy or pseudoscience one, and to be reasonable. I think I sounded a bit like a broken record towards that effect, and I probably could’ve said it a bit less often. But, for those who aren’t going to listen, let me re-state it now in print: I would love for lots of the stuff common to paranormal radio programs to be true. I would love for there to be aliens visiting us and sharing or giving us advanced technology. For there to be bases on the moon, or other kinds of artifacts on Mars that provide evidence for ancient “high technology” beyond a reasonable doubt. But, the evidence that has been presented simply doesn’t meet that threshold, in my opinion. 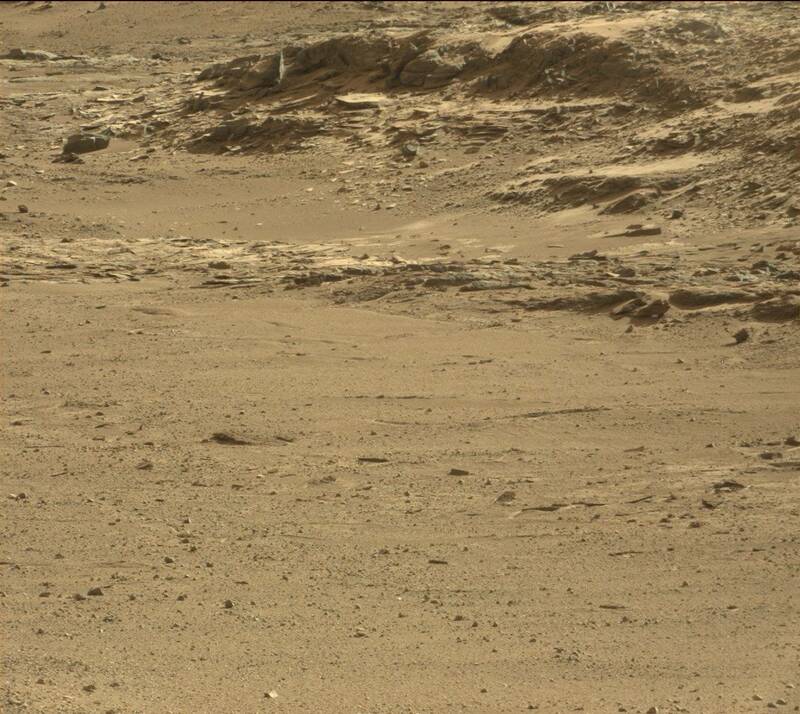 If the best evidence for aliens is a mesa that at high-resolution looks like a natural eroded rock formation, or a few bright pixels that can be explained as a camera defect because it doesn’t show in other pictures of the site taken at the same time, then that simply does not meet my own personal threshold. It may meet yours. It obviously meets some peoples’. But, that is why the scientific community, as a whole, does not accept these things. Would I Have a Conspiracist / “Alternative” Person on My Podcast? No. I was asked this a little before the first hour (of the three-hour program). It was in the context of would I ask Bart Sibrel on the show. The answer, again, is no. The reason that I gave is that the purpose of my podcast is not to be sensationalist, not to present a false balance or appearance of balance. It is a science-based podcast that addresses claims that are “out there” in general or promoted by specific persons. They are up against the entirety of science and evidence to-date. Ergo, a true balance would be to let them have, perhaps, a single second out of my normal ~half-hour show. I think it’s important that whenever one addresses this kind of stuff that they address the claims and not the person. Yes, sometimes it’s important to give context. But in the end, the claims should stand on their own. That’s also why, when I was asked around the 1hr 12min mark, about “what makes a hoaxer” and why they do what they do, I honestly replied that I didn’t know and tried not to speculate too much. In the interview, I tried to do that. I realize it sounds, a few times, like we were bashing on Richard Hoagland. That was not my intent. The reason that Richard was the proponent of several of the claims we talked about is that he is simply one of the main proponents of space-based image-based claims out there, and he has a huge back-catalog of claims spanning at least 30 years. If you get into addressing fringe astronomy claims, you will with almost 100% certainty run into Richard C. Hoagland. I hope that comes across that I was focused on his claims and not him, himself. If it doesn’t, I’ve restated it here for the record. And, since the interview, at least one person has said that Richard should get a “right of reply.” Also for the record, I have no control and no say in that. That is up to the host, producer(s), and Richard himself. I know that Richard is friends with the producer (Keith Rowland), so that may play a factor. That is also why I tried to be particularly sensitive to addressing the claims and not the person. What follows are some of my musings and observations after listening to my interview again, and perhaps some things I wish I would have stated differently. This is not comprehensive to the interview, so you will not be able to get a guide to it by reading this post, nor will you get a flavor for the tone/tenor or total content. For that, you need to listen to the 2.5 hrs I was on. We talked about this for about 20 minutes at the beginning. I referenced the WISE survey with respect to the latest all-sky survey of faint infrared surveys. Here is the press release / story / paper that I was referring to. Also I mentioned the common claim that IRAS discovered it in 1983. Here’s the episode of my podcast (#54) where I addressed this claim. Oh, and IRAS = InfraRed Astronomical Survey. Ug. I wish I knew about the show a month ago. Listening to Sibrel is painful, and every single one of these claims have been debunked. The whole psychology stuff? Utterly unconvincing. Why do the astronauts punch or kick Sibrel? Because they’ve spent 40 years dealing with jerks like him accosting them in public about this stuff. Forty years later (well, maybe 35 at that time), you have Sibrel, a tall, relatively young guy, marching up to an older Aldrin and demanding he swear on a bible while calling him “a coward, and a liar, and a thief,” … what would you do, especially after having been lured there under false pretenses? Or Armstrong looking depressed or upset at the news conference right after the landings … how would you feel if you just spent three days in a tin can, a day on the friggin’ moon (wow! ), but then another three days in a tiny tin can. Your every move scrutinized, in the same clothing, having to urinate and defecate in small bags, eating crappy food, and then you finally get home and you’re dragged on stage to talk to a bunch of people when all you want is a shower and bed (and a real toilet)? I don’t know about you, but I don’t do well the first few days being in a HOTEL (I have issues sleeping in a new bed for the first 2-3 nights), let alone in a tiny capsule for a week. I’d be miserable. Sorry Jimmy, your analogy of just coming off the Super Bowl win doesn’t hold in this case. It would if you then stuck all the players (before they’ve had a chance to shower or change clothes) in a tiny room for three days – give ’em a few bags of freeze-dried food and a few bags to “do their business” in – and THEN have them go talk with the press. Sorry if I come across as P.O.’ed, but Sibrel and his ilk really tick me off by playing these one-sided games, giving you outright lies (yes, we could certainly read the original tapes if they were found), mis-statements (van Allen belts are NOT as dangerous as he portrays, or the stuff about lunar rocks from Antarctica), misdirection (see van Allen belts, or statements about why TV stations couldn’t read the raw feed, or even his statements about how many hours in space the Russians had (it’s quality, not quantity)), or these kinds of “well what would YOU do?” psychology things that leaves out the whole story. Especially if you want to play that whole human psychology stuff, then actually put yourself in the WHOLE situation, with all the crap (literally) they had to deal with, how tired they would be after getting back, etc. As opposed to, “Hey, they are the first people to get back from the moon, they should be excited and want to tell everyone about it!” Remember, these are people, not robots. Since I had posted that, very obviously I should have been prepared to discuss it. And I could discuss practically any aspect of the Moon Hoax stuff at any time, except for the van Allen Belts. Electricity and Magnetism (E&M) and I do not get along. I hated the three semesters I studied it in college, and I did not go into solar physics in grad school because of it. And, he asked me about the radiation. In my tiny defense, there had been a bit of feedback in my headset up to the point when Jimmy asked the question. That disappeared. And it seemed as though he ended the question a word or two short (at 1:03:54, he says, “So, how do you say?” prefaced by talking about the radiation … to me, since the feedback cut out right about that time, and it really does seem as though there should be a few more words to that question). So, I was fumbling trying to pull up a link where I had discussed it before to get my talking points (not realizing I hadn’t actually done a blog post on it), all while also looking at my network transfer speeds and Skype to make sure I was still connected. But, I sounded like a flummoxed moron, and I think it was by far my worst moment during the interview. For the record, here is my podcast episode (#5) when I discussed this. There’s also Clavius.org and Phil Plait who both debunk this. Otherwise, I think I did reasonably okay in this discussion, and I think that my end point should be emphasized again: Conspiracy ideas are easy to make because you just need something that doesn’t make sense to you, and you can state a conspiracy in 5 seconds or less. Debunking them requires a huge amount of specialized knowledge in various fields and takes much longer than 5 seconds. Meanwhile, if I were to satisfactorily explain away every single claim but one, then you would still believe in the hoax because of that one claim. Instead, you should be thinking, “Wow, all of those were bologna, maybe that other one is, too, and Stuart just gave a crappy answer. I should investigate!” I said as much in what I thought was a shining come back for a few minutes around 1hr 17-20min. What I find truly disingenuous of hoax proponents, though, is all this stuff has been pointed out to them so many times. And yet, they keep making the claims without acknowledging any of the refutations. Finally, something I thought of after the show that I should have responded with when Jimmy kept coming back to the technology claim is this: It’s very easy to say, “But they didn’t have the technology!” But, that’s a very general and vague statement. What specific technology is needed? Can there be any substitutes? Now with that list, let’s see what they did have. It is a frequent refrain by any non-mainstream person that scientists just want to uphold the consensus, they don’t want to find anything new, they don’t want to upset the apple cart, blah blah blah. I talked about this in the “Fear and Conspiracy” section of my last post on the lunar ziggurat, but I wrote an entire post on it in 2010, as well. I think Jimmy was frustrated with my very qualified answer to this, starting around the 1hr 35min mark, so let me give a slightly more thought-out response. For me, there is a difference between “think” and “believe,” the entire subject of another 2010 blog post. I don’t think there is any evidence for this. But, I want to believe that it is true. If I ignore my “thinking brain” part, I, like probably most people, have a desire to know if we’re alone or not. I believe the universe is too vast to not have other intelligent life out there. I’m not sure I believe there’s any reason for them to visit Earth at any point in our past versus any other of the countless billions of planets in the galaxy, but sure, it’s possible. But then that concrete part of my brain kicks in when I’m asked this kind of question, and I try to look for evidence. And, I just don’t see any good evidence for it. So yes, I want to believe, I would love for it to be true, but all of the evidence presented so far is not good enough, it does not meet the very high threshold that I hold for such a spectacular and important “thing.” And, some of that evidence has been discussed previously on this blog and/or my podcast. We spent a lot of time on this, starting around 1hr 50min. I don’t really have too much to add, except that I did an in-depth two-part podcast series on the Face on Mars (part 1 || part 2). Jimmy also said that we would have to address “19.5°” at some point during the evening, which we didn’t get to — I did podcast and blog about it in the past. We also talk about the layout of the “city” and other stuff in the Cydonia area; that is something that I have yet to blog or podcast about, but it is something I’m working on for some as-yet-undisclosed projects (undisclosed because I seem to disclose stuff and then it never gets done; this way perhaps I’ll finish something and then disclose it). Here are a couple images, most of them courtesy of the scientists who are actually discussing what this could be (as opposed to UFOlogists / anomaly hunters over on UFO Sightings Daily who first came up with this), via the Unmanned Spaceflight forum: http://www.unmannedspaceflight.com/index.php?showtopic=7825 . There’s a lot of discussion on there about what people think it may be — I suggest skimming through the thread (like posts 20 and 21 or 95). First, here’s the original left/right where it only shows up in one: http://curiosityrover.com/imgpoint.php?name=NRB_449790582EDR_F0310000NCAM00262M_ versus http://curiosityrover.com/imgpoint.php?name=NLB_449790582EDR_F0310000NCAM00262M_ . Second, here’s another left/right NAVCAM image that shows another one. 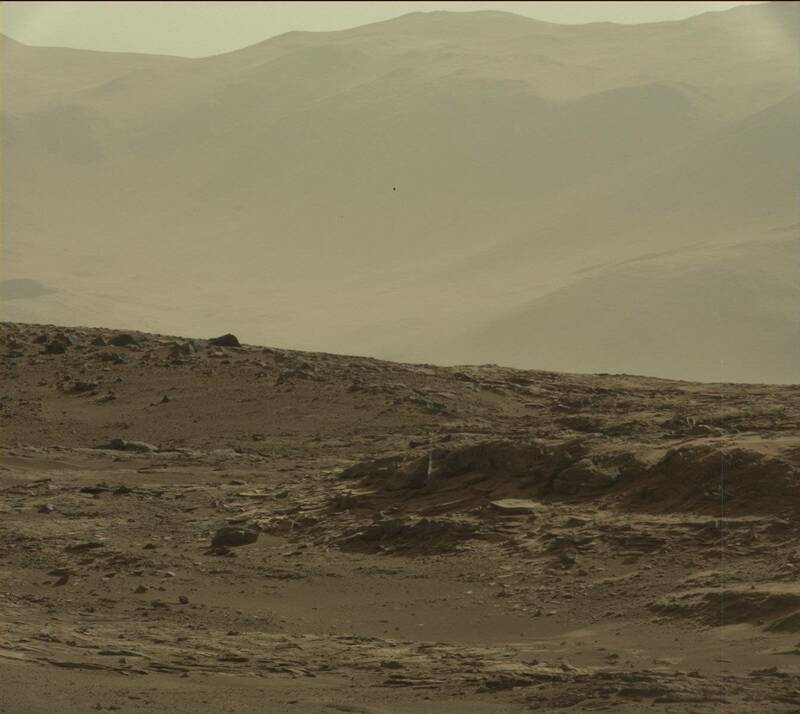 Same camera was the only one to catch it, though if real (“real” = actual feature on Mars) it could be because of perspective/parallax: http://mars.jpl.nasa.gov/msl/multimedia/raw/?rawid=NRB_449700848EDR_F0301254NCAM00252M_&s=588 versus http://mars.jpl.nasa.gov/msl/multimedia/raw/?rawid=NLB_449700848EDR_F0301254NCAM00252M_&s=588nor . When people talk about “the other one of the same site from a different day,” this is what they’re talking about — and no, it’s not the same site. And, here’s a lone cosmic ray hit (or whatever artifact is plaguing apparently the right NAVCAM more than the left): http://www.midnightplanets.com/web/MSL/image/00107/0107MR0682028000E1_DXXX.html (click the image to enlarge it, bright spot is vertically in the middle, horizontally on the right side). Bottom-line: I’m not 100% sure it’s a cosmic ray. I think it’s likely. When most of us astronomers saw it, we immediately went to “cosmic ray” just as aliens people said “alien artifacts.” I do think it’s a bit coincidental to be right on that horizon line. But, I still think it’s more likely to be an imaging anomaly than spot lights or a city. I would love for it to be evidence of that. But, I don’t think it’s good enough when there are other explanations. And as I said, I think the process should be to figure out all the things it *could* be, what fits with all the evidence, and then decide what you think is most likely. Here’s an article describing how the Prime Meridian (longitude 0°) is defined on Mars. And here’s Dava Sobel’s excellent book Longitude. As I said, this is not comprehensive of what we talked about. But, it’s about all I wanted to follow-up on. If you listened to the interview and have a question, let me know, I can respond to you in the comments and/or append this post. Two weeks ago, I was contacted by a Japanese production company, asking me if I’d be willing to do a short interview for a program that they are producing – and probably broadcasting – around March or April. In Japan. I agreed, and I was sent a few different questions to get an idea of what I should prepare. I had only heard of some of them, so I did some research and, as a way to prep, I wrote up “brief” responses. Obviously I wasn’t reading while being recorded, but it was a way to organize my thoughts. And get a free blog post. So, here are ten interview questions and my responses, as prepared. On the show, they weren’t all asked, and a few additional ones were, so I don’t think I’m pre-empting anything by putting these online. Please note that the questions were originally in Japanese, translated into English, and I have edited them a bit for grammar. 1. Why did the moon landing conspiracy surface? Did it start with the 1976 book written by Kaysing Conspiracy? For anything before the internet era, it’s really hard to pin down the start of anything — all you can do is find the earliest example, but there could always be something before that that you simply could not find. Bill Kaysing’s book in 1976 was the first book to claim that it was a conspiracy, yes, and the very fringe Flat Earth Society was one of the first organizations to do so in 1980. However, there are various people who were NASA watchers back during the Apollo era who have variously claimed that even in the late 1960s, there were some people who were claiming that it was all a hoax. But, in terms of contemporary, printed material with a definite copyright date, Kaysing’s book was the first. 2. Do you know what the initial reaction to Kaysing’s book when it was just released was? 3. Following the book’s publish, the movie, Capricorn One, was released. Do you think the movie was released because of the public’s initial reaction to the Kaysing’s book? It’s important to mention that NASA actually helped with the production of the movie, loaning them equipment as props, including a prototype lunar module. If NASA were trying to cover up an Apollo conspiracy, one might think they would not have helped make a movie about them covering up a Mars landing conspiracy. Do you know how much attention the book and movie received at that time? Was there any media coverage about it? I don’t know about the book, but the movie became one of the most successful independent films of 1978. 4. 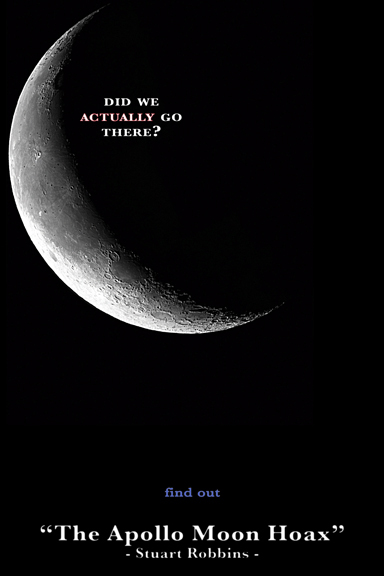 The conspiracy theory surfaced in the 70s, and media brought it back again in the late 1990s and early 2000s, such as FOX’s TV special program, “Conspiracy Theory” and the book, “Dark Moon,” which are about the moon landing conspiracy. Why do you think the media covered this topic again after decades? I’m not sure, but the 1990s saw a resurgence of missions of the Moon and Mars by the United States. People who believed in the hoax could then use that to gain traction. And, if you find a sympathetic producer, or even one who thinks that they can get ratings by making something so sensational like the FOX docudrama, then you can get your show made. 5. The points that conspiracy theorists bring up: Despite the fact that there was a large amount of thrust, there was no blast crater left on the moon. There’s no real reason to have expected a “blast crater” in the sense of an explosion. There was some disturbance of the ground under the nozzle, but it was a blast as in a blast of air. You can also use very basic math to show why you wouldn’t expect one: If you use the specifications, you can show that the pressure under the engine was only about half a pound per square inch. The average adult when walking exerts about three times that pressure. When you clap your hands together, you exert more pressure than the lunar module’s engines did on the surface of the Moon. If astronauts did land, there should have been a large amount of dust floating around, yet we can see no sign of dust on the space suits or their surroundings. There actually shouldn’t have been. This is a case where your every-day experience on Earth does not prepare you for what to expect on the Moon. If I take dust and blow on it in this room, it billows out and slowly falls down after swirling around for a long time. But, there’s no air on the Moon. Any particle that’s kicked up will go up and then drop right back down. There’s no air to suspend the dust. In fact, you can go to movies of the lunar rover and see it kick up dust and fall right back down to the surface which requires the vacuum of the Moon rather than an air-filled sound stage on Earth. 6. About the “identical background” claims on Apollo 16 mission footage, how do you dispel this claim? Some people (such as Phil Plait) have said that it’s just a simple error with the video. They say that Erick Jones, who is the editor of the Apollo Lunar Surface Journal, says that those two clips were taken about only a few mins apart. According to our research, the “identical background” video clips were taken from the NASA-sponsored documentary video, “Nothing so Hidden.” And the documentary is produced by other production company outside of NASA. Therefore, our understanding is that it’s an error on editing stage of production: the production company took wrong clips and audio and used in the documentary. What do you think of our theory? Makes sense. This is an innate problem with conspiracies: You have to suppose this vast maniacal group of people trying to hide the truth, so you can’t trust them on anything. And yet, this claim requires you to trust an original claim that was shown to be in err and not trust the correction. There was a lot of footage taken on the Moon, a lot of audio and video. Stuff gets mislabeled, put in the wrong box, or edited wrong in production of documentaries afterward. Despite all attempts, the people involved were only human, and mistakes are bound to happen. You shouldn’t contribute to a conspiracy what simple human error can very easily explain. Everything was transferred to 16mm film, by the kinescope process. A contractor, The AV Corporation of Seabrook (just a few miles from JSC, or MSFC as it was then known) handled all media requests. They had a pretty good catalog. No doubt there were also copies for internal use. By the time I made a documentary about Skylab, AVCorp was out of the picture and NASA’s own film editors worked with me to search the archive. If mastering on film seems illogical by today’s standards, it wasn’t back then. The point is that film is independent of TV line standards. In those days transcoding between the US and European standards was a highly imperfect process. All our documentaries were produced on film anyway, so a video release would just have been a nuisance for us and the end result would have been degraded. As late as 1981, when I was location producer for the BBC coverage of STS-1, I had BBC engineers getting on my case and refusing to transmit images shot by a US-based ENG (video) crew. We had to go through a ridiculous pantomime pretending that it was a film crew instead. By the time we sent the material back to London via satellite, how could they tell? -For what purpose did NASA produce these documentary videos of the Apollo project? A better question would be, why wouldn’t they? Practically every government agency has a public relations department, tasked with disseminating their work to the public and gathering support and more funding. In addition, Apollo returned a lot of useful science that we’re still using today – including myself in my own research – but it was also a world-wide public relations endeavor to prove that the United States was better than the Soviets. Of course you’re going to make documentaries and put out material to make people aware of it and such a triumph of human engineering. 7. Why do these theories continue to surface even until today? Do you think it’s because we now have easier access to footage from space? Is it a sense of distrust of NASA? I think there are a lot of reasons. One is of course a distrust of government. Another reason is that people like to think they know secrets, and a conspiracy is a big secret. Another reason is that a lot of the lines of evidence that people point to for the hoax are not easily explained because they are contrary to our experience on Earth. For example, one claim is that there should have been stars in the sky because the sky is black, so it must have been night like on Earth and at night you can see stars. But, the sky is black because there’s no atmosphere, it was actually daytime, and the cameras were set to properly expose the lunar surface and astronauts for day. You can’t capture photos of stars with those settings. But, the time I just took to explain that was much, much longer than just throwing out the, “there should be stars!” claim and it’s much easier given our every-day experience to think that there should be stars, rather than take the time to understand why there aren’t. a. If there is no official statement, conspiracy people will point to that and say that NASA won’t even defend themselves. b. But if there is an official statement, then conspiracy theorists will say that NASA took the time to respond to them so there must be a controversy and they must be hiding something and you can’t trust anything the government says anyway. c. In addition to that, Congress will wonder why they should be paying NASA to respond to ridiculous claims, and so NASA risks having their budget cut. This happened maybe a decade ago when NASA was going to pay James Oberg, an American space journalist and historian, to write a book dispelling the hoax claims. And NASA lost-lost-lost: First, conspiracy people said it was a disinformation campaign; second, Congress wondered why NASA was spending money to do this; and third, when NASA cancelled it because of the outcry on all fronts, the conspiracists claimed NASA cancelled it because it really was a hoax. 9. There are still images taken by the Voyager of Saturn that Dr. Norman Bergrun, as author of “Ringmakers of Saturn”, claimed to show a UFO. What do you he possibly mistook it for? This is an example article about Dr. Burgrun’s claim. Bergrun’s process was to take photos that were published in things like newspapers and magazines, put them under a microscope, and take a photo of them through the microscope’s eyepiece, and then look for weird tings. When going through that process, you are going to find weird things. Every example of a spaceship or alien or whatever that he has can be VERY easily explained by dust or gunk getting in the photo, or uneven illumination, or film grain, and the anomalies he found do not appear in ANY other version of the images. In fact, one such example that Bergrun points to as a UFO is a bright speck in the bottom of an image, except the bottom part of that image is clearly NOT part of the image that Voyager took because the rings cut-off about 20% of the way from the bottom. This shows that the photo he’s using is a reproduction, including blank area, and he’s pointing to image anomalies caught in that duplication. – And there are the 1996 infrared photos by the Hubble Space Telescope in 1996 [SJR– actually, 1995], and some people insist that that is a UFO. What do you think of it? What do you think it possibly is? The refereed photos are shown here. They look like moons to me. Each exposure was 5 minutes long, and stuff moves in 5 minutes. In fact, one of the outer-most moons that’s within the rings, Atlas, goes around Saturn every 14 hours. In the time that photo with Hubble was taken, it went about 0.6% of its orbit, which would mean it should be a bit elongated. Every moon interior to it would be even longer because they would have moved farther in its orbit in the same amount of time. 10. In addition, there is now footage that NASA releases to the public on their homepage, and this footage or stills sometime show space debris or mini-jets that NASA has captured. Then, some people look at those debris or mini-jets, and introduce them as UFOs on the Internet. Why do you think people often do that? I think people “want to believe.” They are going to look for any sort of anomaly or object they can’t explain and then say that, because they don’t know what it is, it is aliens. In skepticism, we call this an “Argument from Ignorance” – they are ignorant of what it really is, so they make up what it is in a way that fits their preconceived ideas. The interview was more focused on the origin of the conspiracy and a bit more on general conspiracies than on debunking particular claims made by hoax proponents. I have no idea how I came off on camera – this was my first “real” moving-picture-type interview other than for the Richard Dawkins Foundation for Reason and Science that I did at TAM last year that has yet to be put online (but apparently they ARE working on it!). We’ll see. They might send me a DVD copy when it comes out. I know my mom wants a copy. Why Can’t We Image Apollo from Earth? Who took Video of Neil Armstrong Descending onto the Moon and the LM lifting off the Moon? This is also a “full-fledged action-packed” episode featuring all other segments: New News, Q&A, Feedback, Puzzler, and an announcement. The announcement is: Though it’s a bit early to say for certain we’re not all going to die this December 21, I’m starting to look for back-peddling by doomsday proponents for a follow-up episode very early next year. If anyone listening to this podcast happens to come across something by anyone who claimed stuff like Planet X would cause a pole flip, a big solar storm would wipe us out, or even on the positive side that we’ll all be able to levitate and do instant healing, and you see these people start to make up excuses for why it’s not happening, please send it in! P.S. I tried a new noise removal setting in this episode as well as a different equalizer. I also saved it at slightly higher bitrate. Let me know if there are still issues, or if the audio at least sounds any better. Episode 44 has been posted, a tad early. I recorded this episode almost a week ago, and I’m posting it now roughly on time, though a bit early, when I happen to have internet at this conference where it costs $13/day/device (yes, seriously). Anyway, this episode ended up being surprisingly short even though I go through four of the primary ways that I use to demonstrate that people really landed on the Moon with the Apollo program (I would say “prove” but I’m very cautious using that word these days — real “proof” only comes in mathematics). The four methods I use are ultraviolet photos of stars, the rocks, lunar laser ranging, and actual photos of the sites from lunar orbit. There’s also a Q&A, puzzler (solution to last puzzler and this one will be in July 24th’s episode), and the main segment. Otherwise, that’s about it and perhaps why it came in at about 21 minutes. Slightly late, episode 35 has been posted. I go over four photography claims dealing with crosshairs and shadows. I’m also considering experimenting with making this episode (and potentially some other visual ones) into YouTube-type videos. Let me know what you think. Oh, and this episode introduces a new segment — new news related to previous episodes. It seems like I just put out an episode. Which I did. Here’s the second regular episode for the month, another one on the Apollo moon hoax/conspiracy. I’m trying to go through the claims that don’t rely on a bunch of photographic evidence because, obviously, that’s difficult to do during a podcast. So I picked about a half dozen claims related to the specific category of claims of dust and rock, and I discussed two rock-related independent ways to show that we actually did land and bring back astronauts. It’s also a bit long, almost 40 minutes. Enjoy. This is a quick post to let you know that episode seven has been posted of my “Exposing PseudoAstronomy” podcast. This is an off-bimonthly episode, so it’s a bonus, and it’s long (about an hour). It’s a live recording of my ~50-minute talk at the Colorado Springs Skepticamp from August, 2011. Enjoy! This post is less about “pseudoastronomy” and more about what you (or anyone) with an internet connection can do with the amazing pictures taken by NASA’s Lunar Reconnaissance Orbiter. Though I suppose it’s also related to the Apollo Moon hoax in that we finally have a camera in orbit that’s capable of seeing the Apollo landers. The Lunar Reconnaissance Orbiter (LRO) spacecraft has been in orbit of the moon for nearly three years. It has a suite of instruments onboard, though the one we want for this exercise is called the Lunar Reconnaissance Orbiter Camera (LROC). This camera actually has two “lenses” on it — a wide-angle camera (WAC) and a narrow-angle camera (NAC). The spacecraft is in an orbit that, with the field of view of the cameras, allows WAC images to have a pixel scale of 100 meters, and the NAC has a pixel scale of about 50 cm (0.5 meters, or about 20 inches). And that’s just cool. So we’re using LRO’s LROC’s NAC. Lots of a.c.r.o.n.y.m.s. Each NAC image is about 2.5 km wide and generally about 50 km long – a tiny fraction of the surface of the moon. You could use the LROC image search feature and find the Apollo landing coordinates from Wikipedia or some other source, put them into the search, and go searching for the Apollo sites that way. You could cheat a bit and use this website’s list of NAC images with the Apollo landing sites in them (that’s what I did). Then you can use the LROC image search and search for that exact image and click on it. Or, you can directly go to the URL http://wms.lroc.asu.edu/lroc/view_lroc/LRO-L-LROC-2-EDR-V1.0/M113853974RE and replace that last string of letters and numbers (M113853974RE in the case here, which is for the Apollo 16 landing site) with the image ID. Then, search! You can use the Flash-based tool that the LROC team has set up on that page to zoom in and out and search for the landing site, or you can download a TIFF image (generally around 20-50 MB) from the link towards the top (“Download CDR PTIF”). Sometimes using the information and image on the site with the list helps you to find it more easily. But while you’re searching, you’ll find a lot of other interesting features. 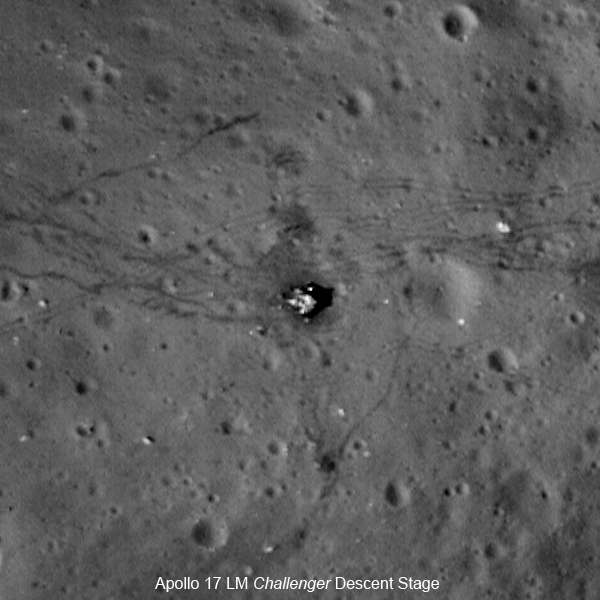 You could find the Apollo 17 “Challenger” descent stage along with the astronaut tracks (story about that on the LROC site here). And if you end up liking treasure-hunting on the moon, you may find Moon Zoo a citizen science project, of interest. When identifying the NAC images to look through, one thing to pay attention to is the “incidence angle” or “solar altitude” which tells you what the shadows are going to be like. You may think that it’s best to see these when the sun is directly overhead (solar altitude is 90°, or incidence angle is 0°). But, this isn’t actually the case, You want longer shadows so that the features are easier to see. Incidence angles closer to 60-80° or so are generally best (solar altitude 10-30°). But don’t take my word for it — try looking at the same landing site under an 80° incidence versus a 10° incidence angle. While the craters are much harder to see and the landing sites look more like brightness features rather than “3-D” because of the lack of shadows, you’ll see things like bright crater ejecta and dark crater ejecta that the lower sun angles made invisible! Maybe it’s just me, but I actually find this kind of thing fun (I spent an hour looking for Apollo 15 last night in 5 different lighting conditions). It also gives you a nice perspective on the relative sizes of things — not necessarily that the Apollo hardware was “small,” but really how BIG the moon is, and how much we have left to explore. If the solar system were reduced in size such that the sun were a grapefruit (about 10 cm), Earth would be located about 11 meters away. Humans have traveled a mere 2.8 cm, or about 1 inch, into the solar system. I also find it absolutely amazing that in this day and age, there are still people out there who don’t think we ever landed people on the moon. P.S. Please remember my comments policy. I consider anything related to UFOs to be off-topic for this post.